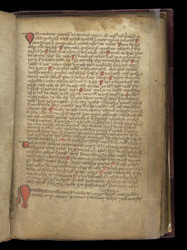 Written by two scribes, one of whom gives the date (1459), place (Cloyne, Co. Cork) and his name as Cormac Mac Duinntsleibhe ('Charles' Donlevy), this Irish medical manuscript has a compilation of remedies, arranged by bodily regions and types of illness. It is a practical manual giving traditional remedies, with little awareness of contemporary scientific discoveries. Unillustrated, it has a no-nonsense appearance, with the type of legible, square style of handwriting usual for Irish medical manuscripts. This page has cures for problems of the eyes and ears. A film over the eyes is treated by "cleansing the body" with laxatives or bleeding. The remedy for earache instructs the physician to "boil ants' eggs, earthworms and sulphur, then upon cotton introduce into the ear." Near the end of the page, a large letter, formed by an imaginary animal; body and head, begins the section on earache, the title of which is written in latin, with the remedy in Irish.